Hi! I am finally back. It has been very quiet on the blog lately after my hard drive failed on my mac! My mac is now back from the shop and working well again. I must say I was pretty upset when they said they wouldn't be able to recover anything from the old hard drive, I am so relieved that I had done a back up a few weeks ago so it ended up ok. This is what I made last night while enjoying a glass of red. I am also going to put this in the CAS on Sunday challenge - black, white plus one. So glad to have you back Tracy - thank goodness for back-up plans!!! 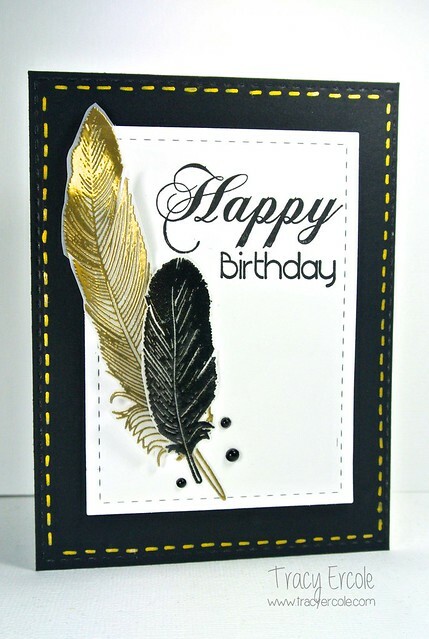 Your gold feather looks FANTASTIC - Fabulous card! So nice to see you posting again Tracy, sorry about the computer issues! Your card is divine, love the gold feather. Have FUN FUN FUN on your cruise!!! Oh - EMMM - GEEEEE!!! I am floored Tracey - this is just stunning. MUST. GOLD . EMBOSS. FEATHER. NOW!!! Glad you could play along with the Clearly Besotted Challenge. Very pretty! I love the gold feather!